Translucent loose powder is one of the foundations of good makeup practices.It is designed to be very light on your skin, and is preferred by most makeup artists to give a finished look. It also has much more staying power than pressed powders, to give a flawless, smooth result. It also works much better at blending than pressed powders, which used to be the staple for many shiny noses. In many ways, loose translucent powder is one of the best choices you can make. Translucent powders don't really add color to your foundations and helps to blend blush and foundation colors together. If you’ve ever seen someone who didn’t bother to blend their makeup, you know how bogus that can look. When makeup isn’t blended, colors stop in place and prominently stand out. That’s not how makeup’s supposed to look. Translucent loose powder is designed to give you a finished look and help your makeup stay in place longer. It also helps to stop that mid day shine that can appear on the forehead, nose, and chin.Normal skin types should always choose a translucent loose powder. It helps to absorb any excess oils that may accumulate on your face.It is also ideal for oily or combination skin types because the powder absorbs oils on your face. Use a talc-based powder, which closes pores and allows less oil to surface and collect on your skin. Rice and cornstarch based powders may cause breakouts. When choosing a loose powder that’s right for you, look for ‘oil absorbing’, or ‘oil free’.Combination skin types should apply loose powder to oily areas only, which are usually the T-zone on your face. It compliments natural skin on your chin and cheekbones and gives you a more blended look.If you have dry skin, you will need to take into consideration that your face can look dry around your eyes and on your forehead. Use a moisture infused loose powder if you can find them. The moisture that is infused in the powder helps replenish moisture to dry areas. You might also choose to keep powder away from these areas, as they can collect in the creases of your face and form unwanted lines in your makeup application.Sensitive skin types should choose a hypo-allergenic translucent loose powder, since your skin is more prone to allergic reactions from cosmetics. A hypo-allergenic powder will decrease the chances that you have a bad reaction. Since sensitive skin can be normal, dry, oily, or a combination of all the skin types you will have to know your skin type to choose your powders accordingly. Before you apply any makeup, be sure your skin is clean. You should apply moisturizers and sunblock to your skin and allow to dry completely before applying any powder. Apply with a brush or powder puff. No Foundation - Apply to dry skin. Use a large brush to brush off residual powder. Mineral Foundation - Apply to skin before and/or after you apply mineral makeup. Use a large brush to brush off residual powder. Cream Foundation - Apply after you apply cream foundation. Use a large brush to brush off residual powder. Liquid Foundation - Apply after you apply liquid foundation. 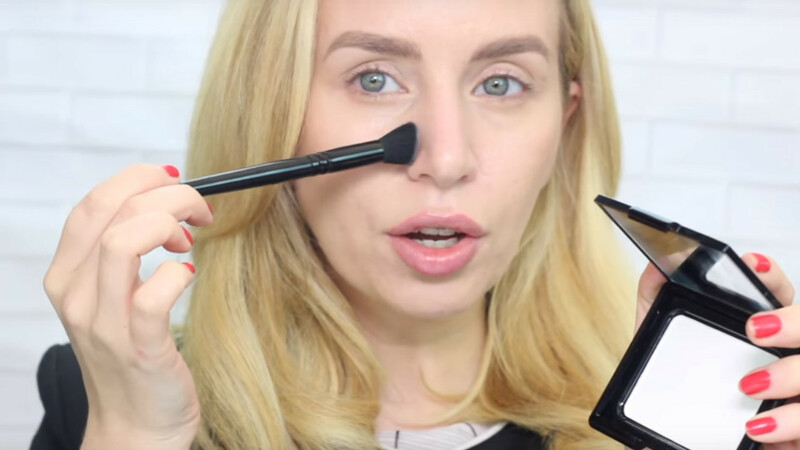 Use a large brush to brush off residual powder.